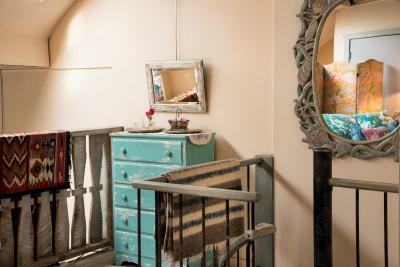 Lock in a great price for Inger Jirby Gallery & Guest Houses – rated 9.1 by recent guests! This place was fantastic! 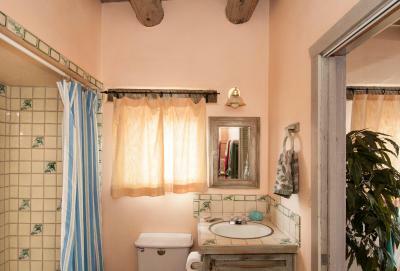 Everything you need was provided, fully equipped kitchen, washer and dryer, all the comforts of your own home. I also loved the quirky decor and art. 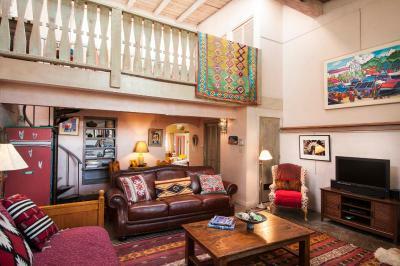 Location was fantastic, you can walk to downtown Taos and the grocery store. Also parking was available. I would definitely come back and stay. I was a happy camper. 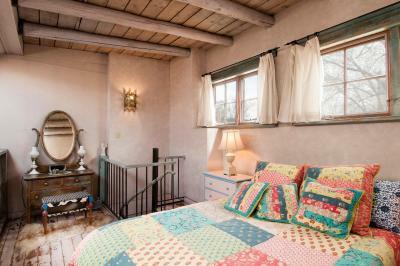 This 1 bedroom "casita" is part of an Taos artist's (Inger Jirby herself!) adobe compound. It's clear from the moment you pull into the drive this isn't an ordinary lodging; the architecture, furniture & decor are a reflection of the art. It was a sanctuary, to say the least. 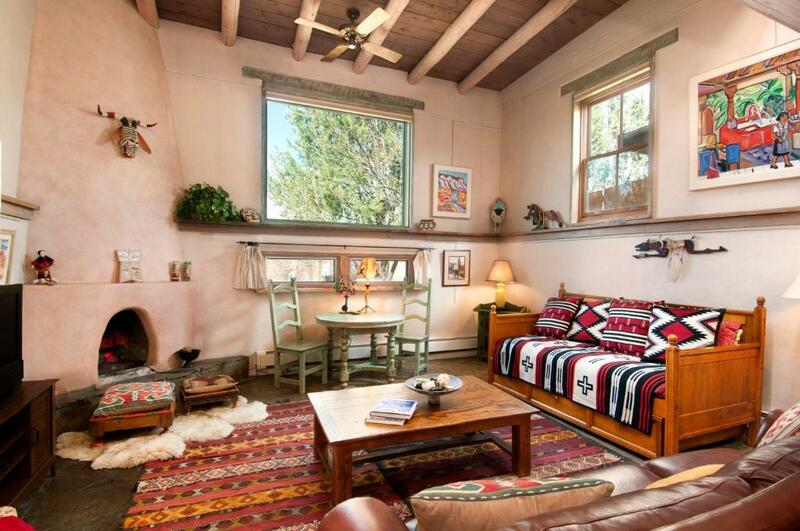 It was beautiful, comfortable, cozy, and central to everything Taos as to offer. Very unique and unexpected. Met Inger while she was painting in her gallery - Amazing woman who seems to have been everywhere and done everything. Location and Ingars work in the apartment. Gallery is adjacent and it’s wonderful to experience her work. This place exceeded our expectations. Great location, very visually applealing, very comfortable. We would stay there again! Real local experience. Rooms are attached to the art gallery. Owner is nice, charming person to talk to. 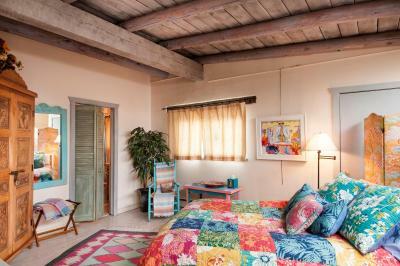 Everything is in walking distance from the location, Plaza, restaurants, shops. Drive to ski valley is 30+ minutes. 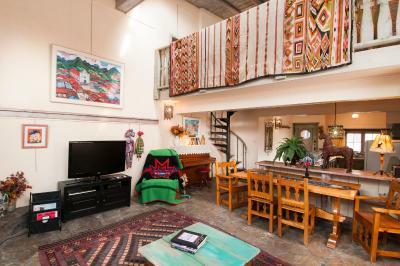 Beautiful full loft-style apartment. Lots of natural light. Spiral staircase to bedroom loft was a little tricky - I can see if you travel heavy it might be difficult to get a large suitcase upstairs, but we came with carry-on size roller bags and were fine. 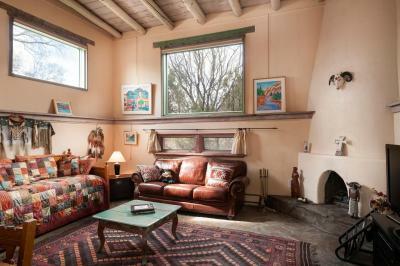 Great location- walking distance to Taos Plaza. Close to everything. Wonderful place to come and relax. Great location. One block+ from Taos Plaza. Beautifully decorated. 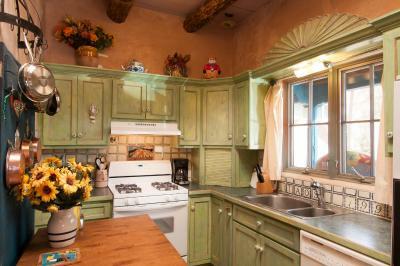 Completely equipped kitchen. Amazing artist/owner. 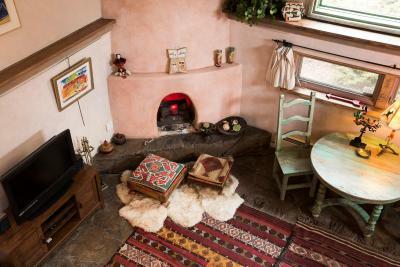 The casita captures the spirit of Taos. We loved it. 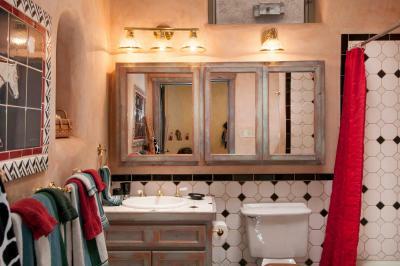 Location, furnishings, art, comfort, attention to detail exceptional. 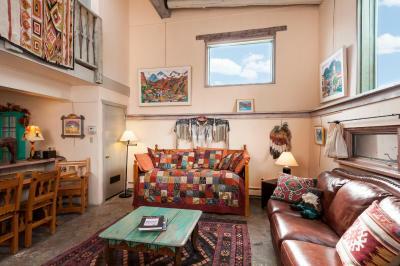 Inger Jirby Gallery & Guest Houses This rating is a reflection of how the property compares to the industry standard when it comes to price, facilities and services available. It's based on a self-evaluation by the property. Use this rating to help choose your stay! Dating back to 1860, this New Mexico accommodations is located in Taos’ Historic District. Featuring original Southwest art and a fireplace, the villas feature a full kitchen and an on-site launderette in each unit. 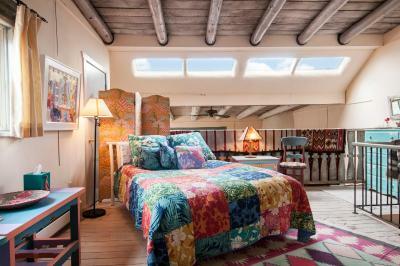 Blending historical elements with modern amenities, villas at Inger Jirby's guest houses feature wood beamed ceilings and a flat-screen TV with satellite. 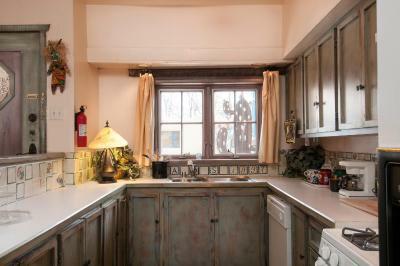 The bright kitchen includes tea and coffee making facilities. 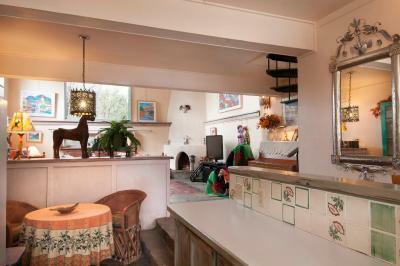 Inger Jirby Villas share the compound with the world-renown artists’ gallery with the same name. 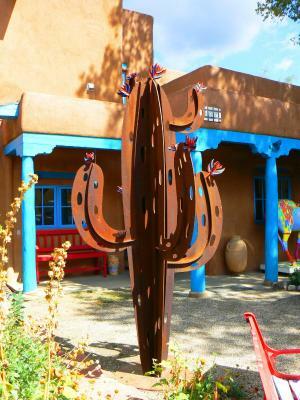 Guests are encouraged to take a stroll through the outdoor sculpture garden. 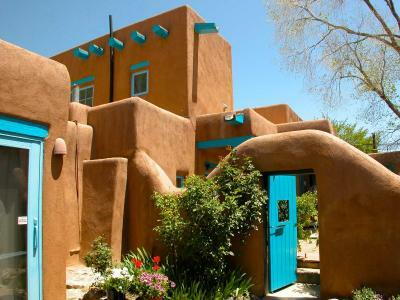 Founded in 1923 and showcasing both traditional and modern Taos art, the Harwood Museum is a short walk from this villa. 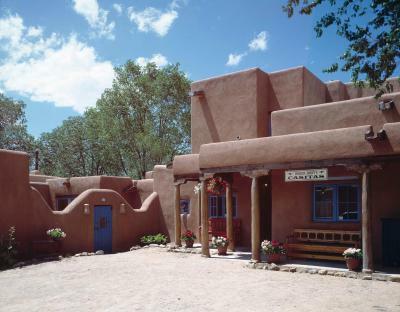 The ancient Taos Pueblo ruins are 3.5 miles away. 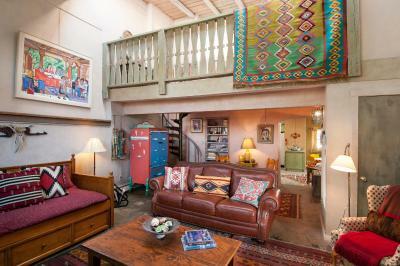 When would you like to stay at Inger Jirby Gallery & Guest Houses? 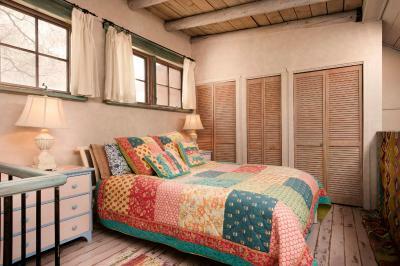 House Rules Inger Jirby Gallery & Guest Houses takes special requests – add in the next step! Inger Jirby Gallery &amp; Guest Houses accepts these cards and reserves the right to temporarily hold an amount prior to arrival. Inger Jirby Gallery & Guest Houses accepts these cards and reserves the right to temporarily hold an amount prior to arrival. difficult for friends to access loft. circular staircase parking is strained. Loved everything. 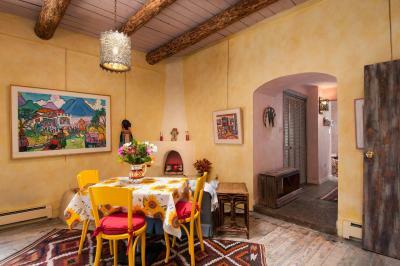 Colourful, arty, cheerful decor. The more you look the more you see. Fully equipped kitchen, laundry facilities. Terrific location among galleries and close to plaza with off street parking. Inger goes out of her way to be welcoming and accommodating. And don’t miss her Gallery. Spiral staircase was very tight for my athletic/broad shouldered husband to navigate. The only bathroom is on 2nd floor off sleeping loft up that spiral staircase...........could have turning into a unfortunate incident after a beer too many for my husband. Also, supposed to be 3 car/truck parking but it's very tight due to on street parking directly across the street from lot. Not a lot not to like. I wished there were some brighter lights. It was rather dim in the apartment at night. Wish there was bottled water for guests upon checkin. We arrived late at night and everything was closed. Tap water was not filtered as far as we could see. My only criticism, which has absolutely nothing to do with the lodging, is that there is not a convenient grocery store, so I would recommend planning a grocery trip as there was not anyplace to walk to to purchase breakfast and lunch supplies. 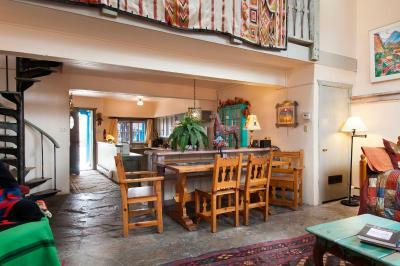 Funky and quirky, this apartment was definitely in the artsy Taos spirit. It's location was great, we were easily able to walk most everywhere in town, and drive out of town for fantastic hiking. It had everything we needed and more. Very small parking area off road. 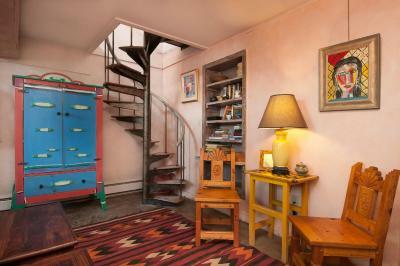 A spiral staircase to access the loft bedroom/bath was small and made it difficult to carry luggage. Location to the Plaza was excellent. 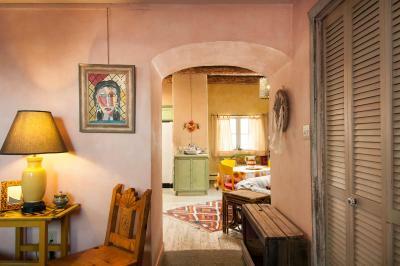 On a quiet road with very large rooms, including full kitchen.